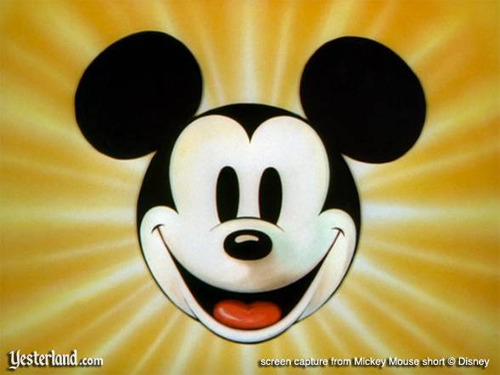 So I have a new conspiracy theory wherein Disney agreed to let Once Upon a Time use Frozen as long as they also used Mickey Mouse’s starring role in Fantasia. And every other Disney property possible. 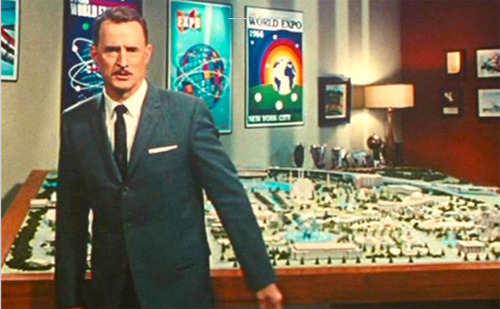 And I will not actually be surprised if the author of Henry’s book is in fact Walt Disney. I might not even be mad. Yes, it would be the ultimate example of Disney putting mouse ears on all fairy tales and related stories ever (see also the upcoming Into the Woods) but in reality the show has always been much more about about the Disney Vault than fairy tales generally. We don’t get Rose Red, White Dove, 12 Dancing Princesses we get Alice, Peter Pan, Mulan and now, amazingly, hilariously, insanely, FANTASIA. 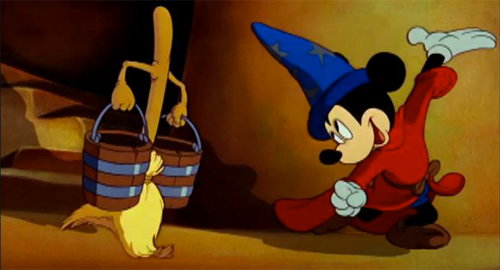 Anyway, Mickey is sweeping up when The Dark One shows up to try and steal Yensid’s magic-hat-in-a-box. An they try to make it look like THIS Dark One is OUR Dark One but even my 9 year old wasn’t fooled because really. THIS Dark One is a bozo named Zoso and the point of this scene is that the magic-hat-in-a-box is an older and more powerful magic object than the Dark One’s dagger which is why, as Mickey tells us, it is super important that no one person ever own and/or wield both. Cue Rumplestiltskin. 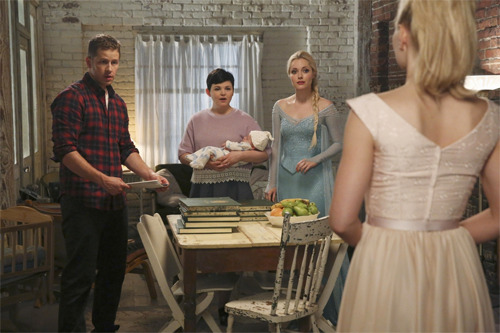 I actually think this dress tells us a lot about Emma right now. At the end of last season she finally made it into the book, into the fairy tale, the life that she could have/should have/would have had if… She got to be a part of Fairytaleland and it meant something to her. Now she’s back in this land of in-between and she is also so, so in-between. In a way Hook is a very safe choice for Emma. Maybe they’ll fall in love and live happily ever after because it really is a fairy tale. Or maybe he’s a trick – like Neal, like Graham, like Walsh – oh well, she knows how to deal with that. This dress is a kind of armor as much as her leather jackets are: she is dressing for the story playing out (“Princess Emma’s First Date”) so she is prepared. Storybrooke is very much the land of in-between. In-between fantasy and reality, in-between now and then, populated by people in-between hero and villain. A lot of this episode felt like a throwback to simpler times, like Disneyland. It has to be on purpose. 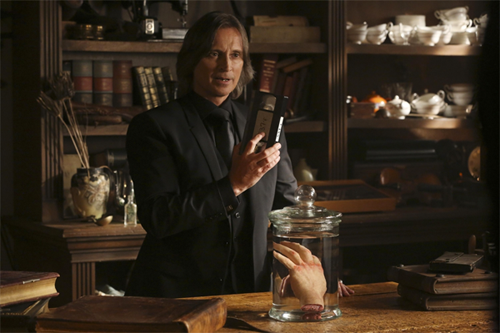 Anyway backing up, Hook prepares for the date by blackmailing Rumple into giving him his hand back. This is exhibit 50,000 in “none of these people ever learn”. Rumple agrees to switch out hand for hook but warns the good captain that this old/new hand belonged to his former selfish roguish villainous self and he should beware. Hook thinks that is the stupidest thing he’s ever heard. I think the fact that anyone ever trusts, listens to, asks for anything from, or frankly talks to and hasn’t yet banished Rumplestiltskin is the stupidest thing I’ve ever heard. Hook and his new hand take Emma to Tony’s Ristorante. The Knave of Hearts lives up to his name by date-crashing, literally actually crashing into the waiter with the wine. Hook grabs Will by the scruff of his neck and spits out a threat like “if you value your life you will lick the spill off the floor!” Emma shakes her head all whoa, it’s white wine, there won’t even be a stain and Hook jumps to the conclusion that Rumple was telling the truth and his new-old hand is EVIL. Emma recognizes Will and starts to run off to catch the thief but decides that hey, he can’t really escape (thanks Ice Wall!) so she can continue her night off with a clear conscience. While all this is going on we also catch up with Anna in the Enchanted Forest of the past. She finds Rumple and asks him why her parents were coming to him. He says he’ll tell her everything she wants to know but only if she does something for him first. I forgive Anna agreeing to this because it was her first interaction with the imp. Everybody gets one pass. So Anna signs the contract and brings the vial of Rumple-wouldn’t-tell-her to the cottage of possible child-eater actual oldest-and-most-powerful-magic-dude-except-for-the-one-he-is-the-apprentice-to aka Mickey (who has a name but why would I use that when he is clearly Mickey). Anna is charmed by old man Mickey and wary of freaky faced riddle master Rumple so she chooses not to probably-poison him. But Rumple is Rumple so of course he purposefully manipulated her into not probably-poisoning him and in so doing she didn’t give Mickey the antidote to the poison Rumple had already used on him and now Mickey is a mouse. Anna rallies the way Anna does and demands Rumple fix Mickey and also tell her what she came here to find out and also try being a nicer person and Rumple laughs in her face. So she grabs a sword and tries to threaten him into complying and I still find it ABSURD that Anna is best at swords but I also think Anna/Swords is a new OTP so I am obviously conflicted. 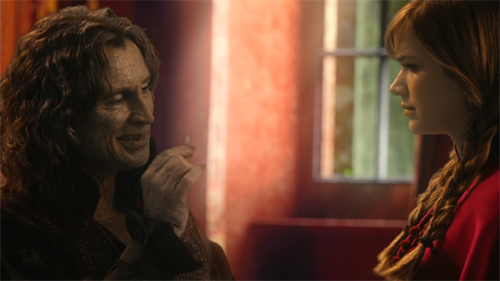 Rumple continues to laugh in Anna’s face because Rumple is a big old meanie with no heart. Anna starts crying, Rumple collects her tears and then Anna proves to be smarter, braver, and better at swords than all of Storybrooke when she snags the Dark One’s dagger, figures its secrets out immediately and commands him to tell her the truth, let her go and never ever come after her or her sister. Anna is my FAVOURITE. Rumple caves and she heads home to Arendelle and finally, finally gets some screentime with Kristoff. Okay, forward in Storybrooke, the date ends with a kiss and Evil Hand tries to make a move that miss “I don’t pillage and plunder on the first date” or her way way overprotective father who I am pretty sure is actually younger and less experienced than her but whatever wouldn’t approve of…so it ends with that kiss and Hook wanders off to take care of Evil Hand before Evil Hand takes care of him. Emma finds her parents waiting up for her and they have a scene that is super cute on the surface but creepy if you think about it too much. I miss Snow and Emma’s first season conversations about dating and relationships. Whatever the screwed up mechanics that make them parents and child they are all three adults. And they’ve only ever known each other as adults. It is awkward for the wrong reasons is what I’m saying. But cute, at least superficially. So Hook returns to Rumple and when blackmail round three doesn’t work because Rumple says “actually I switched the daggers again so Belle DOES have the real one now” and Hook inexplicably believes him, Hook even more inexplicably agrees to YET ANOTHER deal. I do not understand why these people do the things they do. 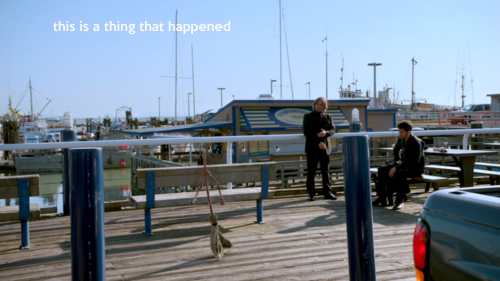 Hook meets Rumple on the docks where he magics a broom and they follow it to Mickey’s house. There is no explanation as to why he’s reverted to human form or why he’s in hiding and staying mum about what he knows about the Dark One, magic, etc. when he’d spent however many thousands of years guarding that hat-in-a-box? Maybe he was tired of it. 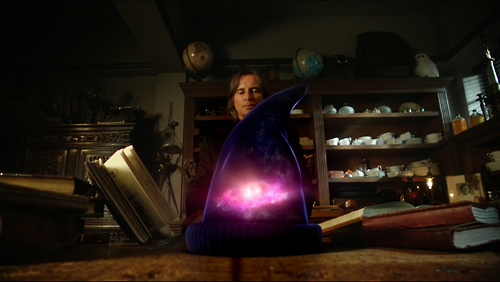 Anyway, Rumple gets Hook to assault Mickey and they trap him in the hat because it turns out it is a magic vacuum. Mickey cautions that the amount of power necessary for Rumple to do what he wants to do (It has to be bring back Neal, right?) will be too much for even him to wield but Rumple laughs in his face. Hook feels gross for going along with this and tries for blackmail round four since Rumple used the real dagger right in front of him so obviously he was lying about giving it to Belle (no way, really? EYEROLL) but Rumple turns it around on him with the aforementioned VHS that shows Hook, and magically only Hook, roughing up the old man. Hook settles for replacing Evil Hand with Righteous Hook but then Rumple turns that around too with the confession that was ALSO a lie (no way, really? EYEROLL SQUARED). Evil Hand was Hook’s Flying Feather, giving him permission to be the bad boy he secretly still is. Hook is so very, very Dumbo. Throughout the episode Another Snow Queen was taunting Emma and she finally tracked ASQ to a shed when she got a call about an emergency at the library. Belle found Will unconscious and clutching a book. He wakes up in jail and Emma questions him about the book and the page he’d wrapped out and Michael Socha’s face gives me a hundred thousand feels. Will declines to explain anything, including that it was Hook who roughed him up, so he gets to stay in jail while Captain Swan make out, due process be damned. Regina spends the entire episode in her vault trying to solve the frozen Marian problem, which is smart since if I were Another Snow Queen I wouldn’t stop at freezing just Marian. She doesn’t find anything but she has two lovely scenes with Henry. I’m ending my discussion with Henry for a couple reasons. One, I really loved all four of his scenes. Two, he’s so sneaky. Henry (literally) pushes Emma to ask Hook out which sets off the whole date night plot. He gets Regina to talk about her complicated position in the Robin and Marian and Frozen Saga. He suggests going undercover to get intel for Regina. And he gets Rumple to take him on by bringing up Neal. Henry has always been sneaky but with Operation: Mongoose he is really stepping up his game. By the time Rumple calls him his apprentice it was already true. Henry has been paying attention and now he is entering the game and I am one hundred percent on board with that.